As an NVIDIA partner we're proud to introduce our new X4, the cutting-edge NVIDIA Tesla computing workstation by XI-MACHINES. 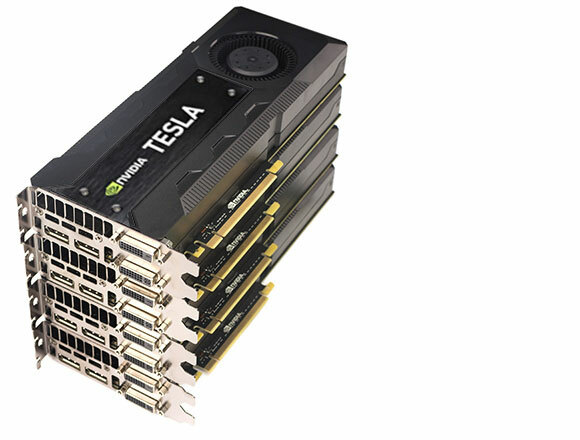 Featuring up to four high-end NVIDIA® Tesla K40 graphics processors, our X4 can now master even the most demanding computing tasks from numerical analytics, molecular dynamics , engineering analysis and CAE to deep learning. In addition to the powerful dual-CPU setup (with up to 44 cores/ 88 threads) the X4 also offers maximum GPU performance for all your computing tasks like CAE, engineering, numerical analytics, molecular dynamics, computational visualization, simulation, as well as deep learning. With up to four high-end NVIDIA® Tesla K40graphics processors with 12GB GDDR5 ECC of dedicated graphics memory and 2880 CUDA processors per GPU, the NVIDIA® Tesla computing workstation is a visual supercomputer for your desk. The visual supercomputer for your desk. Highly scalable HPC (High-Performance Computing) workstation incl. up to four full PCIe 16x dual slot GPUs. Install up to 3 additional PCIe cards (RAID controllers, sync modules, video-boards, professional audio interfaces, additional network cards...) even in a fully equipped X4 quad with four M6000 GPUS (limited length). 10x SATA3-RAID (0,1,5,10), 5x USB 3.0 (2x rear, 2x top panel, 1x onboard port), 4x USB 2.0 (2x rear, 2x via header) dual Gbit LAN, TPM 1.2 header, serial port (1x rear, 1x header), Thunderbolt option etc. e.g. Deep Learning, Finite Element Analysis, physics simulation, CFD (computational fluid dynamics) for aerospace, automotive, industrial design, Medical etc. e.g. automotive and industrial design, data visualization, video walls, high-end and high-resolution realtime rendering, Broadcast/TV realtime signal/media processing etc. e.g. Adobe Creative Cloud (OpenCL™ accelerated effects), realtime stereoscopic 3D editing, OpenCL™-based render engines and plugins, DaVinci Resolve 10 etc. base weight without GPUs and optional extras. Add 1kg (2.2lbs) per GPU.